I'm stressed out of my gourd right now, dealing with major issues in multiple areas of my life. At work, I'm doing the job of four people. I'm experienced and fast enough to handle two jobs at a time, but at four, things are falling off the table and that's been tying my stomach in knots. 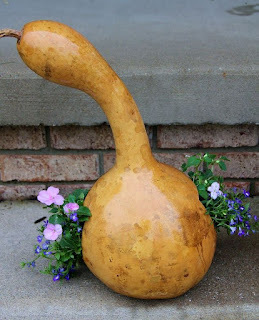 My gourd. I am not in it. A simple solution would be to hire additional help. We have an expert available in house who is dying to work with us and is currently tasked doing menial chores, but for whatever reason*, management won't move them onto our project. To have this cheerful and ultra-competent potential coworker so close is sheer torture. These days, my blood pressure is about double what it normally is. My wife, who has worked in real estate for years, shared a motto she uses herself. "You can't want the deal more than the client." The house might be just right, the price excellent and the neighborhood perfect for the buyer. The purchase ought to be a no-brainer. The sale is right there, right at your fingertips, but the buyer, for whatever reason, won't pull the trigger. You have to shrug and blow it off. Don't stay up at night, don't yell at your windshield while you drive, just let it go. For me, if management didn't want the work to fall on the floor, they'd make that simple move. They won't. Oh well. It doesn't solve the problem perfectly - I'm still buried. At least with this motto in mind, I can slough off some of the stress and stop trying to change things over which I have no power. * - Subordinate lesson: Don't waste your time psychoanalyzing management. Chances are poor that you will get it right and it will do nothing but waste your time. Wish more agents would listen to your wife-- if only because so many we've had are very bad at realizing that we really mean we want a big yard, good internet, outside of the city, and don't care about the schools! The worst one kept taking my husband to these tiny places in the middle of the city that were walking distance to the store and/or nightlife. You would not kick the kids out to play unsupervised. Even before we had kids, we weren't going to the store for amounts you can reasonably walk home with, and our idea of a great night involves hanging out with our online gaming guild, and maybe Chinese takeout or freezer-pizza.